Advertising / Sponsorship Opportunities - Throughout the year, there are many opportunities to promote and grow your business through the GLAA, as well as opportunities to build your brand. Learn more here. Annual Trade Show - Each year the Trade show boasts great attendance of GLAA members. Use this opportunity to tell your story! Set up a booth to highlight your products and services to the decision-makers in the industry! Vendor Minute - Associate Members have the opportunity to speak about their business at the General Membership Meetings. Two Associate Members give a brief speech about their company during the meeting. This is a great opportunity! Meet & Greet with decision makers in the multi-family housing industry who can help you grow your business and aid in your personal success. There are many chances to connect with members - from Membership Meetings to seminars to golf scrambles and Keeneland outings - there is something for all. 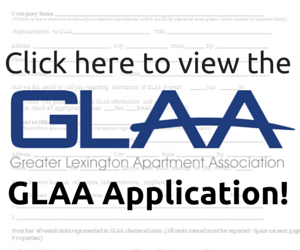 As a member of the GLAA, you are automatically a member of the National Apartment Association. 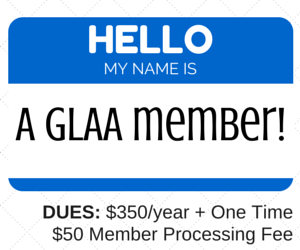 You may use their member logo, as well as the GLAA logo on your business cards, website, etc. You will also have the opportunity to participate in designation courses though NAA as well. 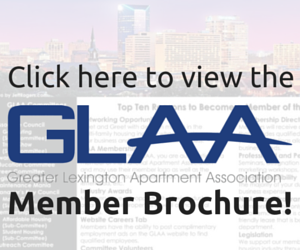 Members will receive a full membership directory that includes every Regular and Associate member of the GLAA. This list includes the main contacts for each property who is a member, as well as qualified associate members listed in a Yellow Pages format that is very easy to search. 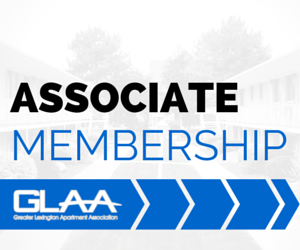 GLAA strives to provide the best ongoing education for its members. Yearly seminars include topics ranging from Fair Housing to Budget Seminars to Time Management. Working within a committee also gives a member the chance to work with others who will aid in their personal development.